I openly admit that I have an excessively long bucket list. This last weekend I finally had a chance to strike off something that has been dangling at the top of the list for years. For my birthday my best friend agreed to accompany me on a 7 hour trek to see the World's Oldest Ham. The Ham in question is 110 years old and resides in the Isle of White County Museum in Smithfield, VA. Legendary Ham salesman P.D. Gwaltney found a spry 20 year old ham that had been misplaced in a shipping warehouse. Gwaltney was surprised to find that the ham looked remarkably fresh for being two decades old. Gwaltney was a salesman and unlike most people who find old chuncks of meat in a warehouse, he saw opportunity. It was the 1920s and refrigeration was still a new-fangled luxury. Gwaltney decided that this ham would be a great way to show how refrigeration was uneccasary. Gwaltney would show that a piece of ham not only did not reqiure refrigeration, but its shelf life was seemingly infinite. Gwaltney marketed his ham as still being edible. The point that Gwaltney took it tad far was when he had the Ham outfitted with a collar and leash and declared that it was his "Pet Ham". Gwaltney insured his ham for $5,000 dollars. It is said Gwaltney and his Ham were inseperable as they traveled the country extolling the limitless virtues of Ham. In 1936 Gwaltney died. The Ham would make Gwaltney proud, as it still lives on to this day. The Ham is now 110 years old and potentially still edible (depending on your definition of edible). Still wearing its collar the Ham as it sits at the Museum, looking kind of like a Mummy's thigh. But the Ham has good company. Gwaltney also owned a peanut buisness, so naturally he also possessed the world's oldest peanut. Its from 1890, if you were wondering. 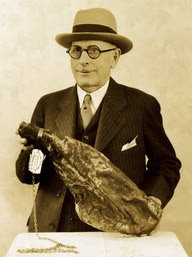 There is also an old Ham from the 30s, but it pales in comparison to its ancient brother. And last but not least: The World's LARGEST Ham. Which was cured in 1955, making yet another very old Ham. It was cut from a 900 pound hog and originally weighed 90 pounds, but lost almost 30 pound of water weight in the curing process. It still has a whole pig's hoof on it. I heavily recommend that everyone make the trek out to Smithfield to pay their respects to Gwaltney's pet Ham.